Its a strange concept when somebody test drives a vehicle with one of the most potent horsepower ratings around only to know there is something even better just round the corner. This is the case with the 707hp Dodge Challenger SRT Hellcat and the soon to come out 840Hp Dodge Challenger Demon. 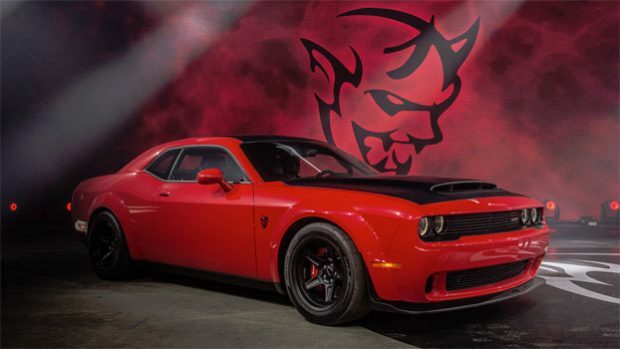 This is the start of the story from an article from the nydailynews.com which tests out the Dodge hellcat and amenities with a close eye on the upcoming Dodge Demon. The Hellcat doesn’t just have a potent 707hp 6.4-liter or 392 Hemi V8 engine, but plenty of creature comforts. You can choose from an eight speed automatic or six speed manual transmission, with two heat exchangers which can drop the temperature of the supercharger by hundred degrees. It’s a modern-day muscle machine with the power of a supercar and room for five adults. A vehicle its grand parents from the late 60s and 70s would be proud of. All this adds up to power ratings such as 3.6 seconds in 0 to 60 mph, a quarter-mile in 11.2 seconds at 125mph on stock Pirelli PZero tires or 10.85 seconds at 126.18 mph on drag radials and a top speed of 199 mph. Having all this power at your disposal at a reasonable price compared to a supercar with the same power output seems incredible, but the Dodge Demon, although faster is still a limited edition model, so the Hellcat is still is king of the muscle cars for now.